The Pension Fund Regulatory and Development Authority (PFRDA), with an objective to meet the subscriber’s sudden financial requirement enrolled under NPS, has liberalized norms for partial withdrawals which also include reduction of requirement of minimum years of being enrolled under NPS from 10 years to 3 years from the date of joining. Suitable amendments were made through “Pension Fund Regulatory and Development Authority (Exits and Withdrawals under the National Pension System) (First Amendment) Regulations, 2017 and the same has been notified on 10.08.2017. With an objective to allow individuals (under NPS-All Citizen Model and Corporate Sector Model) who are in the age bracket between 60 years and 65 years to join NPS system. Suitable amendments were made through “Pension Fund Regulatory and Development Authority (Exits and Withdrawals under the National Pension System) (Second Amendment) Regulations, 2017 and the same has been notified on 06.10.2017. 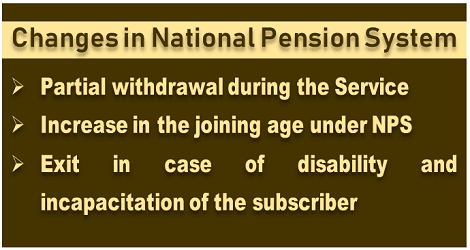 With an objective of facilitating easy exit & withdrawal in case of disability and incapacitation of the subscriber covered under NPS, PFRDA has made suitable amendments through “Pension Fund Regulatory and Development Authority (Exits and Withdrawals under the National Pension System) (Third Amendment) Regulations, 2018 and the same has been notified on 02.02.2018.